Helps reduce post-prandial increases in blood sugar levels. Helps maintain optimal cholesterol levels. Reduced molecule size for maximum absorption. 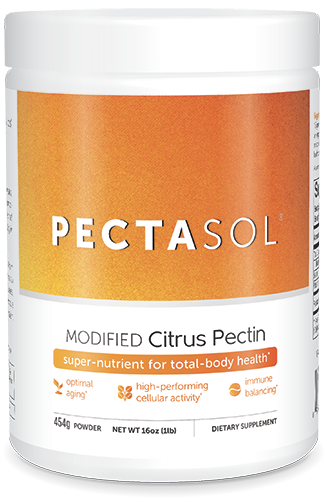 Pectasol® modified citrus pectin is a sophisticated nutraceutical scientifically recognized for its ability to interfere with the aberrant mechanisms of cellular adhesion. Specifically, Pectasol® inhibits the binding properties of certain cancer cell surface proteins, called galectins-3. When malignant cells are prevented from sticking to each other to form colonies, as well as from sticking to normal cells and vessel walls, they can be destroyed more easily by the immune system. In a phase II clinical study, Pectasol® considerably slowed the PSA doubling time in prostate cancer patients. The same galectins-3 are present in cancer cells of the breast, colon, lymphatic system, skin, brain and larynx. Other studies suggests that Pectasol® inhibits the growth of tumours, angiogenesis and metastasis in all cases where galectins-3 are the cause (ie, the majority of cancers). Oral administration of Pectasol® significantly increased urinary excretion of arsenic, cadmium, tungsten, mercury and lead, thus supporting the case for more exhaustive investigation of its use for eliminating toxic metals and xenobiotics from the body. Following the Chernobyl nuclear accident, scientists used pectins, (albeit non-modified and thus less effective than Pectasol®) with some success to eliminate plutonium and strontium from the intestines of irradiated individuals. Other preliminary findings suggest that Pectasol® may also be effective at reducing high cholesterol levels and atheromatic plaques as well as at influencing certain mechanisms which lead to Alzheimer's disease. Normal pectins have a molecular chain which is too long to be absorbed into the bloodstream. Pectasol® is produced in accordance with a lengthy, costly and patented enzymatic process which creates a smaller molecular chain. In fact, Pectasol® is designed to have uniform molecular weight (between 10,000 and 20,000 daltons), a low degree of esterification (10% maximum) and the right pH for optimal absorption. PectaSol® is a registered trademark of EcoNugenics. Each dosette contains 5 g of PectaSol®. In serious cases, take one dose (five grams), mixed with lukewarm water or fruit juice, three times a day. For prevention purposes, begin with 15g a day for one month, then reduce to 3-5 g a day. To promote elimination of environmental toxins and heavy metals, take 3-5 g a day.